PhoneTree 2100® connects to your computer's USB (Universal Serial Bus) and operates with Windows 98, Me, 2000, XP and WIndows 8 and 10 . Just plug-in the supplied phone and USB cables, load the software from your PhoneTree 2100 ® CD and you're ready to go. Expandability: Start off with a single line system and when you need it expand it up to as many as 4 lines. 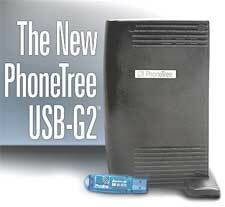 You can increase your capacity to as many as 48 lines with the PhoneTree 2500 system.